I have created a small demo page with two editable ComboBox controls. The first one is filled with some ComboBoxItems, it's Text is set to 'Hello World !' which not exists as ComboBoxItem. The second is databound to some sample data (Products). There are three TextBlock controls below each ComboBox. The Text of the first TextBox is databound to the SelectedIndex of the ComboBox. The second to the SelectedItem using a custom function in the MainPage. The third to the Text property of the ComboBox. As you expect you can now edit the text inside the ComboBox. The SelectedIndex is set to -1 once you type a custom text. The third TextBox which is databound to the Text is updated on a TextChanged of the Text, not only on lostfocus (like SelectedItem). In the MainPage class there is a SampleData property which contains some Product objects. It also contains the methods SelectedComboBoxItem() and SelectedProduct(). These methods are used for databinding the SelectedItem to the Text of the TextBlock. The SelectedComboBoxItem() shows the Content of the selected ComboBoxItem or the entered text. The SelectedProduct() shows the ProductName of the selected product or the entered text. The ComboBox has also a new TextBoxStyle property. You can use it to define a custom style for the TextBox inside an editable ComboBox. I hoped that I could use it to remove the spell checking but unfortunately that doesn't work. As you can see there is still a red squiggly line if you make a typo although I have set IsSpellCheckEnabled to False. The IsEditable is a small but important new feature. WPF already had edtable ComboBoxes. 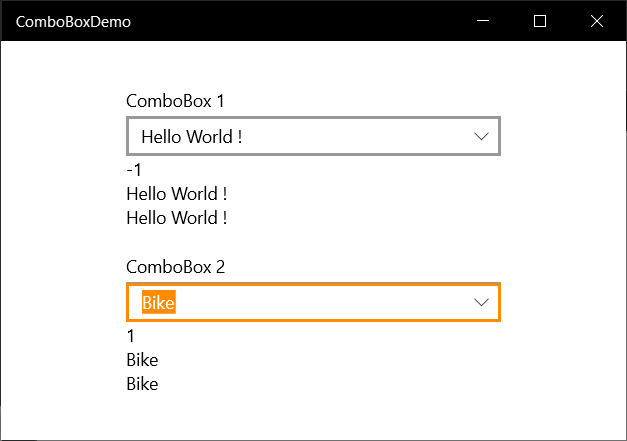 In Windows Forms the ComboBox has a DropDownStyle which you can set to DropDown. 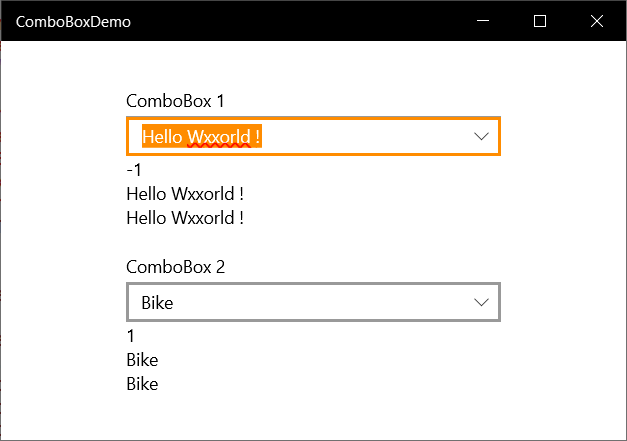 Now you can have the same thing in UWP.